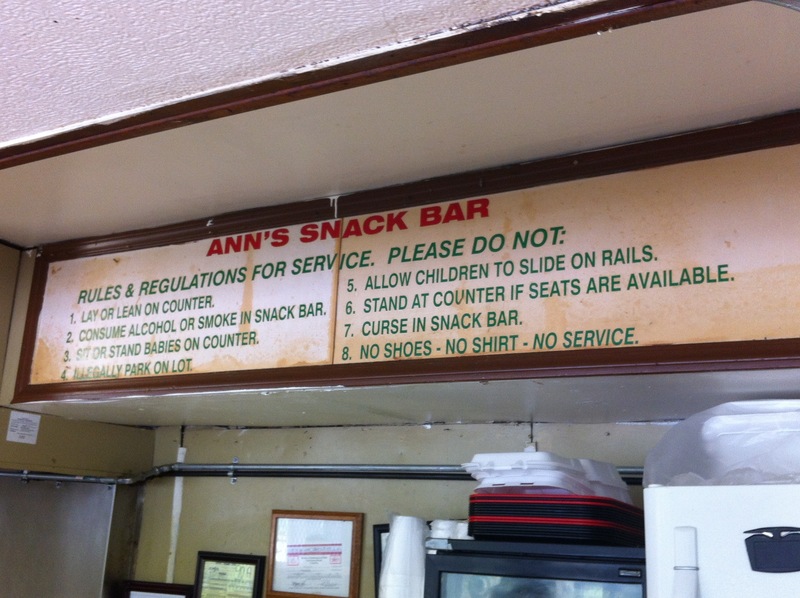 It’s been almost three years since our series of visits to Ann’s Snack Bar. We went. Then we took our girls. Then we took my parents (that was a hoot). As we prepared for a weekend-long birthday celebration, Jo asked what I wanted to do this weekend – a long-delayed revisit to Ann’s was on the list. We headed downtown early, determined to make the first “seating”. When we arrived, around 10:15 (she opens at 11:00), we saw that there were already a couple of cars in the lot. I decided that we better go ahead and get “in the queue”, so we waited in the car while a couple of folks cleaned the patio and sat out chairs. Looking back, I didn’t remember there having been tables on the porch last time we were here. And I certainly didn’t remember the additional folks working. There was one couple waiting in their car next to us (one, two), so that made us three and four. (The numbers are important, because there are only eight seats inside. On an earlier visit we had been numbers eight and nine and that resulted in an additional forty-five minute+ wait.) About five ’til, the gentleman that had been mopping the porch came out the door and waved us in. These are the rules that govern the snack bar. We deferred to the other couple at the front door and they, then we, headed to the left side of the trailer. 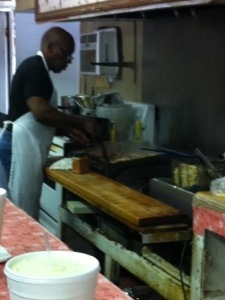 Miss Ann said to start at the other end, so we about-faced and I took the seat at the far end of the counter. 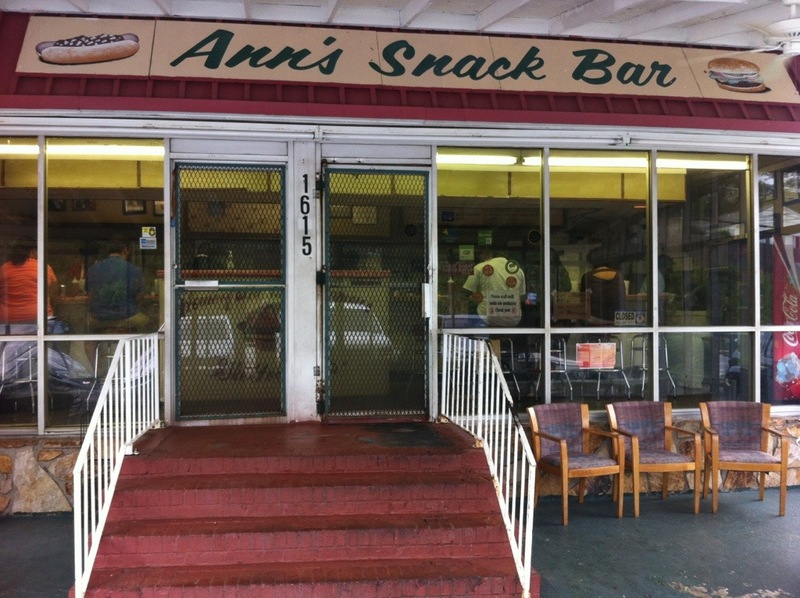 Just to re-cap, Ann’s Snack Bar has been in business since 1972 in a single wide trailer on Memorial Drive, just east of Moreland Avenue. The last time we visited, it was shortly after my burger quest began. 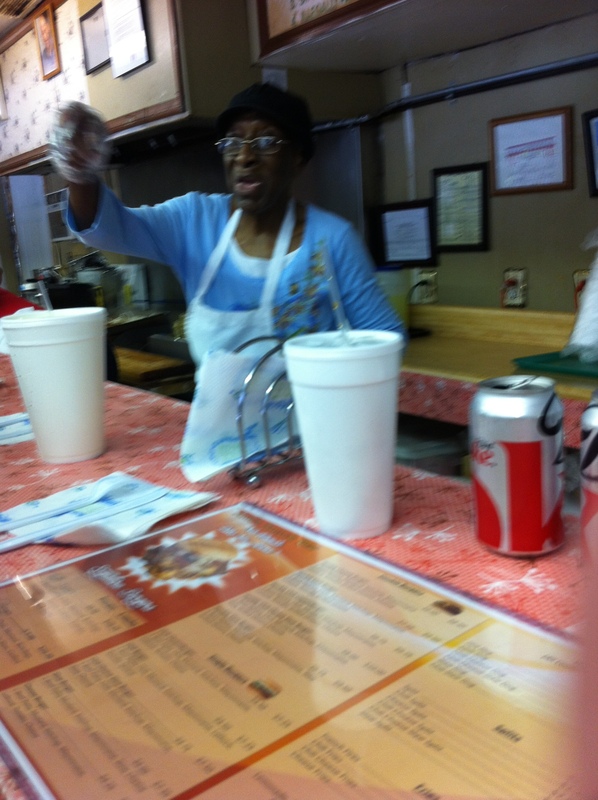 At that time, Miss Ann single-handedly seated, served, cooked for, and cleaned up after eight people at a time. No quarter was given. There was no take-out line – you waited to come in and then sat at the bar and ordered. 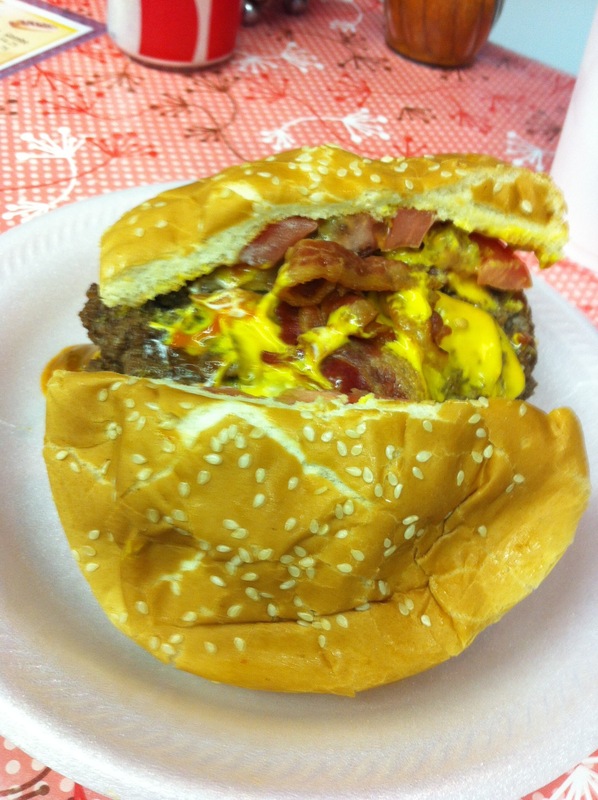 She had become world famous in March of 2007, when Raymond Sokolov, the WSJ food critic, proclaimed the Ghetto Burger at Ann’s the best burger in America. That was why we were so surprised when there were four people with aprons behind the counter. 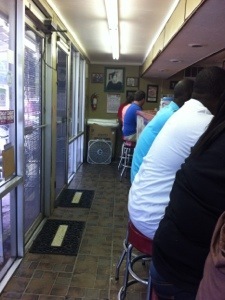 A young lady walked to the end of the counter where we were seated, and asked, “Who was first?”. She then took our orders, in the order that we arrived. 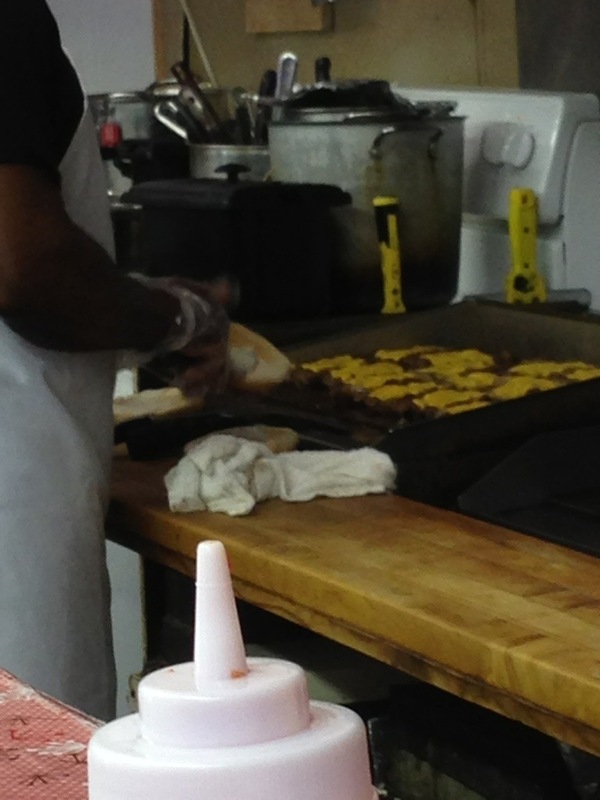 Once all of the orders were in, the lone man behind the counter counted patties and threw them out on the griddle, one handful of beef (a half pound?) per patty. The burgers were slow-cooking and after he flipped the burgers the first time, he placed sliced onions on the burgers that included those. All the while, there was a big boiler pot on a red-hot eye on the stove (you can just see it over the griddle) steaming, filled with chili. While all of this was occurring, one of the ladies was dumping fries in the deep fryer. Somewhere in the midst of this, Miss Ann came around to bring us tableware. Jo commented on the additional help and she said it was due to her health: between blood clots and a bout with cancer, she said she hadn’t worked much since last summer. She also said she was just starting to come back and do a few things – in fact, one of the ladies questioned why she was there. I honestly believe that her 40 years of work “with no vacation” is what helped her fight her way through her illness. She’s determined. And opinionated. And a treasure. While she was talking, I noticed them dropping my split (hot dog cut almost in half lengthways and split vertically) into the deep fryer. Huh? I expected it to be thrown on the griddle. Interesting. Just as he placed the cheese (Kraft singles) on the burgers, he counted buns, opened the kitchen stove next to the grill and laid the buns on an aluminum foil lined shelf to heat them up. We were getting close. Three minutes later, he started putting burgers together. One. Two. The couple next to us was served. For reference, the difference in the Ghetto and Hood burger, is that on the latter, the tomato and lettuce is replaced by cole slaw. And the price goes up $0.50 (only $0.25 with the combo – which adds fries and a drink). which was really good. 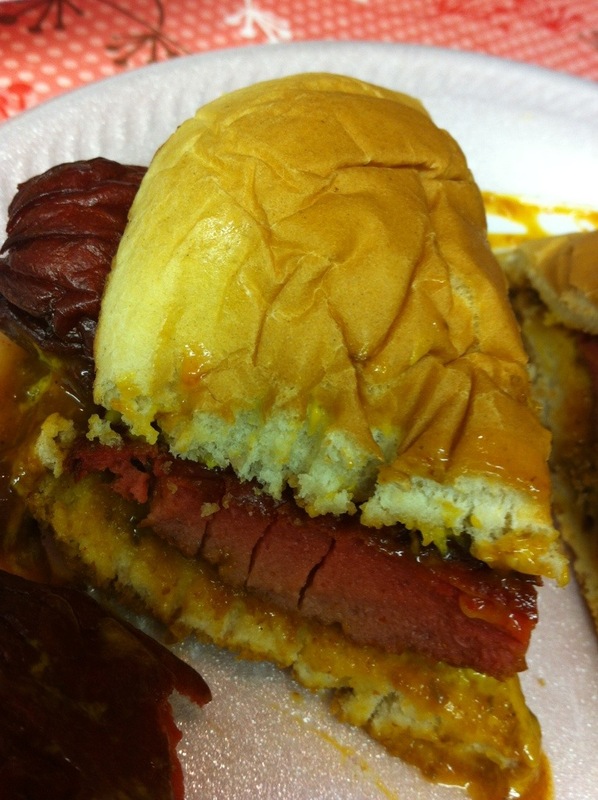 I had never had a fried hot dog, but it created color layers in the dog, like a red hot. 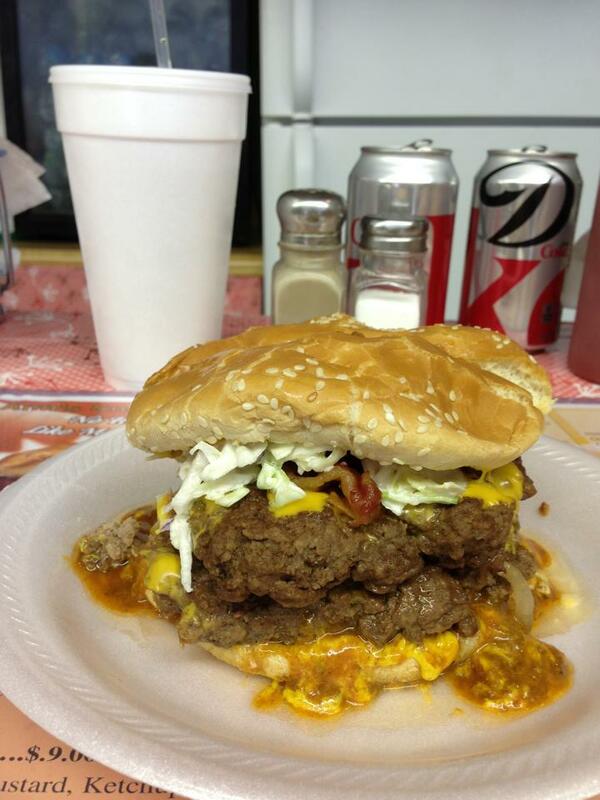 With that much lunch to eat, I only ate about half the split and three-quarters of the burger. We had fries as well, but they are in a class nowhere near that of the burgers and I only ate a few. If you haven’t been, you need to go. And, if you want my advice, go early. And keep in mind that they are closed on Mondays. And order a slice of cake (pineapple, chocolate or red velvet – all four full layers) to go. There’s a lady that bakes those and brings them in daily. We were there during the delivery. I’ve heard they’re amazing. In fact, we brought two slices home.